Shikhar Dhawan continued his impressive run in T20Is as he scored an impressive 55 to guide India to a comfortable six-wicket win over Bangladesh in the Nidahas Trophy. Earlier, Jaydev Unadkat (3/38) and Vijay Shankar (2/32) ensured Bangladesh were restricted to a paltry 139/8 in the first innings. Brief Scores : Bangladesh 139/8 (Liton Das 34, Sabbir Rahman 30; Jaydev Unadkat 3/38, Vijay Shankar 2/32) lost to India 140/4 (Shikhar Dhawan 55, Suresh Raina 28; Rubel Hossain 2/24, Taskin Ahmed 1/28) by six wickets. Winning the toss, Rohit Sharma decided to bowl first while stating that the pitch "seemed to get better and better" in the loss against Sri Lanka. Rohit also announced that India had decided to stick with the same batting line-up for the second game of the series as well. India had a chance to gain the upper hand early in the game but some confusion between Washington Sunder and Manish Pandey gave Soumya Sarkar a life in the very first over. Similar to the previous game, Rohit decided to hand the ball to Washington in the second over of the game and the captain was rewarded as his all-rounder gave away just four runs. Sarkar, who hit Unadkat for a six in the third over, was sent packing after he tried to scoop the ball over short fine leg but could only find the palms of Yuzvendra Chahal. India thought they had Tamim dismissed LBW but DRS showed that ball had pitched outside the leg stump. Two boundaries later, Thakur had his man as Tamim holed out to Unadkat. By the end of the powerplay, Bangladesh had managed to reach a score of 44/2 and looked flustered at the crease. Das was handed two lives in a same over as Raina and Sundar dropped him and he made the Indians pay as he built a 31 run partnership with Rahim. However, with Rahim being dismissed by Shankar, Bangladesh slowed down again and could only manage 69/3 at the halfway point of their innings. With Mahmudullah being sent packing by Shankar, Bangladesh could only manage six runs in two overs. However, over the next three overs, with Sabbir Rahman and Das at the crease, the Tigers managed to add 32 runs as they looked to launch a late onslaught on the Indian bowling. However, those dreams came crashing down as Das’ fighting 34 run innings came to an end as he was finally caught by Raina with Chahal, who was bowling his last over, deceiving him in the air. The wicket appeared to be the final nail in the coffin as the Bangladeshis failed to connect with the ball with the next two overs yielding just 10 runs as their score crept upto 121/6 at the end of the 18th over. Knowing that a full-fledged onslaught was required to get the score to respectable score, Sabbir and Taskin took 11 runs off the first three balls of the 19th over. However, Unadkat was in no mood to have a terrible over and despite giving away two wides, he got the all-important wicket of Sabbir, who ended up with 30 off 26 balls. In the end, Bangladesh could only muster a score of 139/8 thanks to a tidy last over by Thakur who gave away just 5 runs. 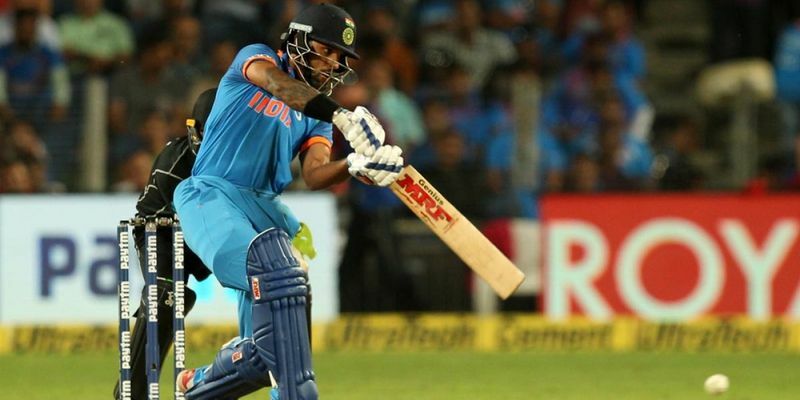 India signalled their intent early as Shikhar Dhawan hit Mustafizur for a boundary on the second ball of the over, which eventually leaked nine runs. Rohit got into the act in the next over as he smashed Taskin for two boundaries. By the third over India had already accumulated 27 runs as they looked to run away with the game, but Rohit dragged the ball back onto his stumps to give Bangladesh a small opening. Even though Rishabh Pant, who was promoted ahead of Suresh Raina, was dismissed in similar fashion to his captain, India found themselves at 47/2 by the end of the powerplay overs. Dhawan and Raina upped the ante after the powerplay as they added 21 runs to the score in the next two overs to bring the equation to exactly a run a ball. Realizing that they didn’t need to risk too much, the Indian duo decided to just knock the ball around for singles and at the halfway point managed to take the scoreboard to 81/2 which meant that they needed just 59 runs off the last 10 overs. With 20 runs coming off the next two overs, the result appeared to be a formality. However, with Raina falling to the short delivery again, Bangladesh would have hoped to claw their way back into the game. But as Dhawan scored a boundary in the next over the equation came down to just 20 required off 24 balls to put an end to Bangladesh’s resistance. Even though Dhawan was dismissed while attempting a slog in the 17th over, Bangladesh knew that the game was up when Mustafizur Rahman leaked 11 runs to leave India needing just 3 of the last two overs. The winning runs came off Manish Pandey’s bat as India secured the win and the first points with six wickets and eight balls to spare.